For the effective protection of reinforcement steel against corrosion and oxidation. Jahn M95 Anti-Rust was developed to protect ferrous metal reinforcement such as rebar and threaded rod from oxidation and corrosion caused by salt and moisture. 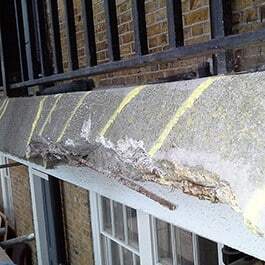 Concrete and masonry failure is often caused by the rusting of reinforcement steel. As the rust expands it blows causing cracking. Jahn M95 Anti-rust is a liquid glass consisting of a special silicate which encases the steel completely isolating it from oxygen and water. M95 Anti-rust is highly alkaline with a pH of 12. This provides an extra protection against rust and as silicate is also a component of concrete this liquid glass bonds excellently.